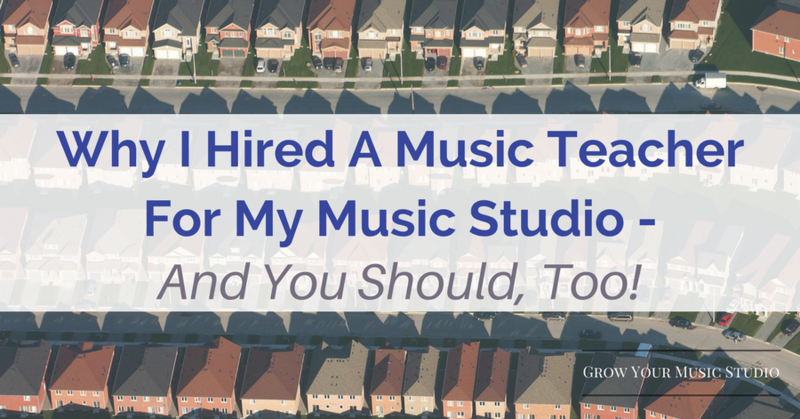 Why I Hired a Teacher for my Music Studio - And Why You Should, Too! This summer I hired a teacher to teach lessons for my studio. Today, I’d like to show you the reasons why you should hire a music teacher. Furthermore, I’d like to show you how to make this as pain-free and simple as possible. You might never have considered this before. You might already have a dozen teachers working for you. No matter your situation, my aim is to write something so useful and detailed that you find an insight here! To do this, I’m going to draw on my experiences hiring music instructors and employees over the past 15 years. I am also drawing on the experiences of Travis Palladino. 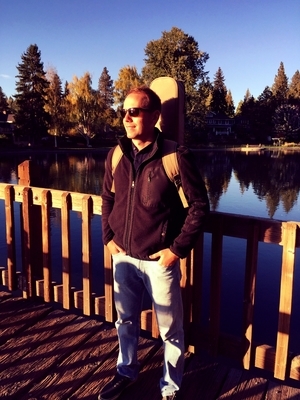 Travis is the founder and director of a virtual music studio called Music Flow in Bend, Oregon. Music Flow has no physical building. Teachers travel to student’s homes and teach them in their own space. My 9 compelling reasons for hiring a teacher. Don’t be afraid! Working with another teacher is neither a hassle or a burden. I was shocked at how simple this entire process was. The website and resources I used to find 12 candidates in less than 4 weeks. How to protect you and your studio from legal trouble. The 6 step process I used to hire a teacher in seven weeks. I am primarily a group lessons teacher. My schedule is completely full with grade-school to high-school students. When at capacity, I see about a 100 students per week in group. Because of this, I’ve turned away adults and preschoolers from my studio for half a decade. When I finished the 2016-2017 school year, I spent some time reflecting on my results. I checked the “leads” that I had received during the school year. From November of 2015 to September of 2017, I had over 240 people contact for me piano lessons. Of that number, 83 were preschool or adult students. I was absolutely blind-sided by this number. I had no idea that I had turned away almost two full studios worth of students in under a two year period. Disclaimer: This wasn’t my first rodeo. I have hired many employees and contractors for this blog and managed a team. Furthermore, I did get experience hiring teachers in my early to mid 20’s when I ran the Piano Express summer camp. However, it had been almost a decade, so I was a little rusty. The point is… don’t let lack of experience stop you. I definitely went into this feeling like a novice (even if I wasn’t technically a novice). That was my story. Why might you want to hire a teacher? #1. Hire an employee to take students you cannot. You might have a demographic that you don’t serve or don’t like to serve. For me, it is adults, preschoolers, and transfer students, etc. Hire a teacher to teach those people for you. #2. Lose your wait list. A wait list helps no one. You don’t get paid. The student might lose interest while waiting. The parent might find another teacher in the meantime. Convert that wait-list into cash by hiring a teacher to take those students on for you. #3. Unorthodox studio growth strategy. Since beginning this blog, many teachers have asked me for help with their studios. A good number of those teachers have wanted to start a studio so they could leave their job. These teachers often work a day job and then teach piano after work. This is incredibly demanding. An easier strategy would be to hire another teacher first. One could begin building an income while learning the ropes of studio marketing and management. Almost no one considers this, and yet it would be a much easier and simpler way to start a new studio! #4. Save a current student. If you have a current student that you can tell is going to quit at any moment, you could save them with this handy tactic. Get out ahead of this student, and tell the mom that you are sensing little Johnny needs a change. “I can tell your little one is getting a bit frustrated with lessons. I think a switch might be good for him! Would you like to try a different program and approach for a few months?” Many parents will happily commit to this plan. #5. 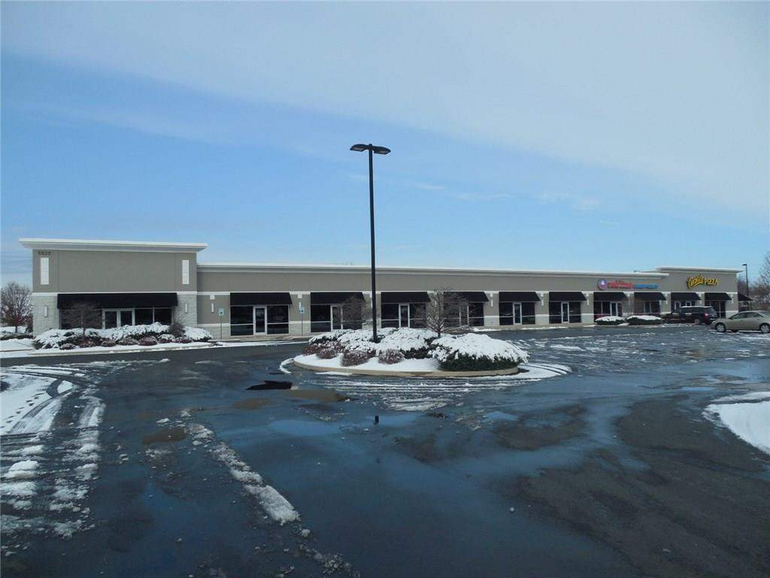 Build income to expand into a location. Not every teacher wants to manage a music school or have a location. For those who do, they could limit risk by building a VIRTUAL studio first. This will increase profits without increasing overhead. One teacher with 25 students could increase your studio’s net profits by $1,000 or more per month. That extra income can go a long way. Use those profits to provide a buffer that will pay for the lease or mortgage on a place. #6. Make your location irrelevant. Do you live out in the middle of a rural area? You could set up a virtual studio in the nearest big city and hire instructors to teach students there. You could manage it from afar. Sound far-fetched? I know of several teachers who cover HUGE territories in their local area with a virtual studio (Nashville, Long Island). They have several HUNDRED students registered. Don’t let that number daunt you. Rome wasn’t built in a day. If you want it, you can build it. #7. Give back to the profession. This one came to me over time. My decision to hire was driven by the bottom line. Additionally, I wanted to capture a type of student that I didn’t normally see. However, as I began to talk to some of the prospective instructors, I realized they were new to the profession or they were talented teachers who didn’t know how to market. I decided to invest heavily into whichever teacher I hired. I wanted them to get a sense that they were getting more from me than they were giving. I wanted to help them become a better teacher. People crave mentorship… if you offer it, they will gladly take it. In fact, I’m getting the sense that this is almost more important than the steady paycheck I’m providing to them. It is a big intangible, and I’m happy to provide it. #8. Expand your offerings beyond your skill level or instrument. This is obvious. 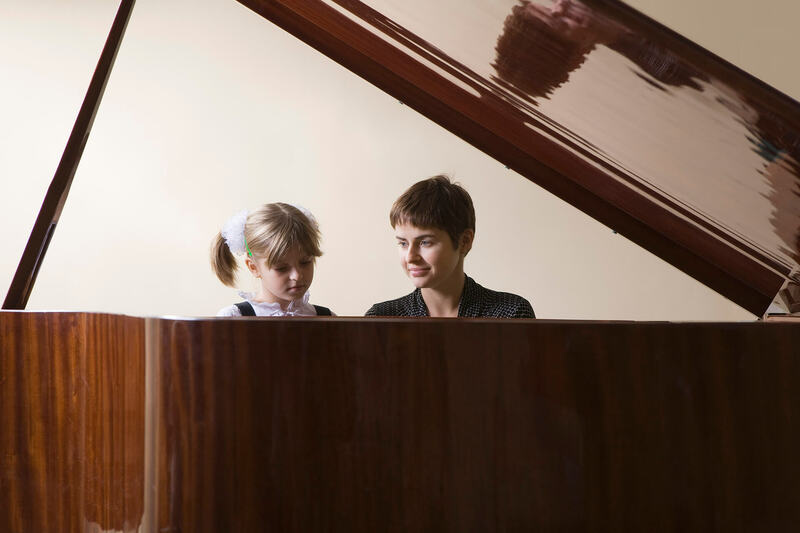 If you teach piano or violin or voice, that’s just one tiny part of the musical universe. What if your second teacher was a guitar teacher? Your third teacher was a strings specialist? You have widened your market and, thus, your income opportunities. #9. Save on location costs. You should offer virtual lessons even if you currently have a location and multiple teachers! It could help you expand into a new area of your city. It could prevent you from having to expand your location size (thus having more overhead). You will serve a demographic that will happily pay premium for convenience (typically, wealthier families). Exciting ideas! But how do you find a great teacher? Isn’t it difficult? Here’s the truth about finding a great teacher: It was a lot easier than I thought it was going to be. It has taken up very little of my time… and I’m running my own full studio, a marketing and coaching business, and this blog. Other music studios can be great referral sources for music instructors. Build community and relationships with these other owners. You can then trade referrals for instructors that better fit each of your studio’s needs. For example, a talented instructor is looking for a long-term gig and what they are currently offering is a seasonal one. Or, one studio has an overabundance of guitar instructors while the other has collected many piano instructors. How wonderful to collaborate and trade these contacts! No matter what industry you are in, Google is your best friend. Search for relevant keywords: these include what you need and your local area (i.e., piano teacher Chicago or drum instructor Napa Valley). You will get results from Google, Craigslist, and even instructor websites. You can also add other keywords to narrow down your search and hone in on the talent that you are looking for. It doesn’t take very long. You’ll find musicians and teachers with semi-full studios. The number of teachers who had semi-full studios that wanted to align with Travis’ studio was surprising. Social media is a powerful tool, as well. Like Google, you can use it as a tool to search out other instructors and musicians. And, you’ll learn a lot about that person in the process. Facebook, Instagram, Snapchat, Musical.ly, and YouTube are currently the best platforms to start your search. You can get to know instructors and assess their skills before you speak or meet in person. Not only that, you can use it to screen teachers who apply through other means. More on that later. As with many things, it’s less about how to do this, and more about WANTING it bad enough. I (personally) wasn’t sure exactly how to do this when I first started. So, I went to Google and just started typing in search phrases. Obviously, I’m not finding teachers here. 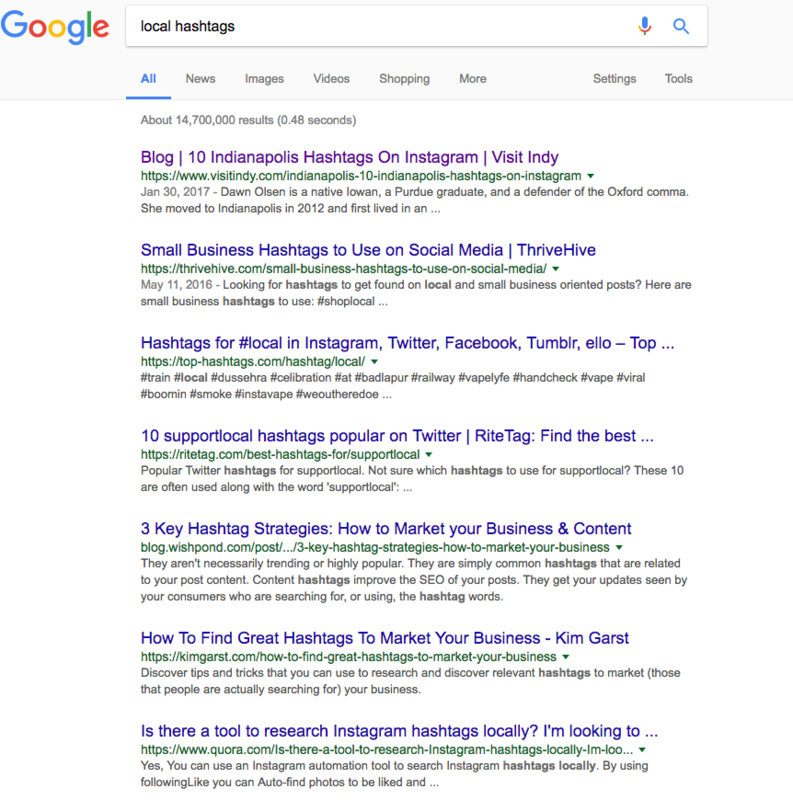 But, that top search return led me to an amazing page that gave me HUNDREDS of local hashtags… which I could use for marketing, outreach, and local awareness. My point? Stay curious. Experiment. Try things out. Allow room for happy little accidents. By the way, the same goes for you! Instructors are looking at your site and social media presence. What are you telling them about your studio? It might be time to up your game on Facebook or overhaul your Web site. How do you do this? Establish a quality online presence. Make sure that your website and social media profiles convey a clear message of who you are, what you do, and the type of students and instructors you want. 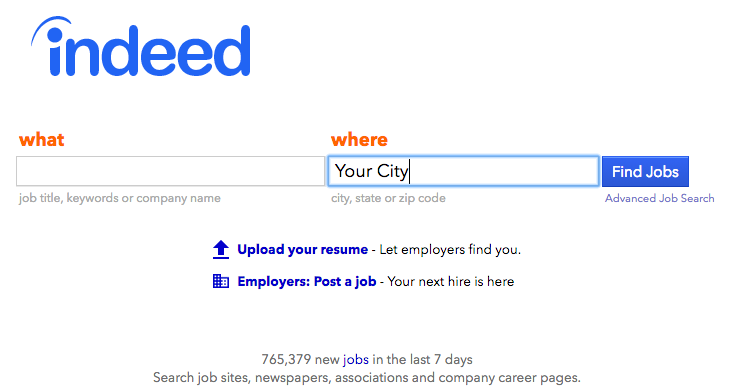 I’m going to plug Indeed.com, which I learned about from a coaching client of mine. This is how I got my first instructor. On a whim, I put up a short but thorough job posting on Indeed. Within 4-5 weeks, I had a dozen job applications. I ruled out half right away, and several strong contenders. Eventually, I chose one… and he is AMAZING. This process took about two months. I didn’t stress over it. I let it come to me. And, once I completed my search… I have continued to keep in contact with some of the others. Having a good team means WANTING a good team… and that means the recruitment process never really ends, even if I don’t need an instructor right now. How do you hire effectively? Keep it simple. All you need is to follow these steps and inject your own creativity in the implementation. The first step is to find potential candidates (or letting them find you) who match your studio’s needs. The five methods mentioned above could be all you need. Exhaust these channels until you find a short list of candidates to choose from. This step is simple. Musicians upload their music and videos to YouTube, Facebook, and Instagram. Take a moment to search them out and assess their talent as a musician. It takes more than musical talent to be an instructor. You have to make sure they are a good fit to represent your studio and to work with your students. Personally, I ruled out several prospective teachers immediately based on their social profiles. I found huge red flags: unsavory behavior or evidence of unreliability. If I could easily find it… so could parents in your studio! 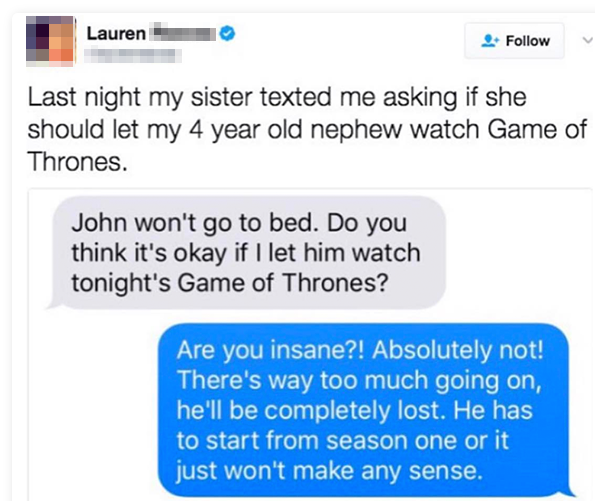 Sometimes, there are some that just suggest that outright disaster (not going to screenshot those). If you are not vetting teachers using social, you are asking for trouble. Success is in the details; don’t skip this step. The tool is there. You should definitely use it. Before scheduling an “in-person” interview, I scheduled a short phone call with my “short list” of candidates. I wanted to scare them off or get them to disqualify themselves. Yes, I was trying to push them away! Of course, you are going to ask the typical questions. But past that, I wanted to be very clear and firm on my expectations. If you want to avoid future troubles, you need to communicate the facts. Make sure the emotional impact of those facts land with the prospective instructor. Come out and tell them what the experience will be like for them. Don’t try to hide or downplay uncomfortable facts or massage the truth. This will come back to bite you. It’s tempting to do this when you have students waiting to start. It’s tempting to do this when you’ve just had an instructor quit and you now suddenly have 23 orphaned students with no one to teach them. For me, this involved being very upfront that instructors would be traveling to student homes. I emphasized that if they felt uncomfortable about this in any way, they should just tell me no now. Several did. I got the sense that if I downplayed this, some of these people might have joined just for the paycheck. Where would that have left me? With half-hearted instructors! Instructors whose first impression of me was lying, half-truths, and manipulation. That’s not going to lead anywhere that I want to go. You don’t want to go there either. Things are getting serious now! Anyone making it this far is a serious candidate. It’s time to meet them. This ccould be a sit-down meeting at your studio or a coffee shop. Travis even suggests playing music together if you meet in your studio. During this step, you can discuss payment, rates, how much students pay. You can also go over when and how they get paid. Encourage questions as it is important at this point that you are on the same page. Thus, this step can happen continuously with step 4. When I met with my first hire, I brought the instructor agreement with me. My plan was to immediately offer the job if they answered my questions satisfactorily. Payment – This stipulates how much they earn from each class as well as how and when they get paid. Insurance coverage – Since they are independent contractors, they need to be self-covered. One company a lot of independent contractors use is MyFitCo (LINK: com). This insurance provider was originally designed for sports and fitness trainers but their coverage can be applied to independent music instructors as well. As independent contractors, they can teach their own students as long as there is no conflict between their own classes and your studio’s. Regarding that last point… Should you hire them as an employee or an independent contractor? I’m not a lawyer, and I don’t play one on the Internet. Consult a lawyer. So many factors play into this decision: local laws, your situation, your goals, etc. You can also include general guidelines to teaching in the contract. This is because while creative teaching methods are encouraged in music, you have to make sure that as your representatives, their teaching style is compatible to that of the company and the needs of the students. Have a lawyer review your contract to limit risk and protect yourself. Travis recommends using an affordable option like LegalShield. Plans start from $39. You can email your contracts and have a team of lawyers review them as opposed to paying hundreds of dollars for a retainer fee. I mentioned earlier that a strong web presence helps you attract talented teachers. 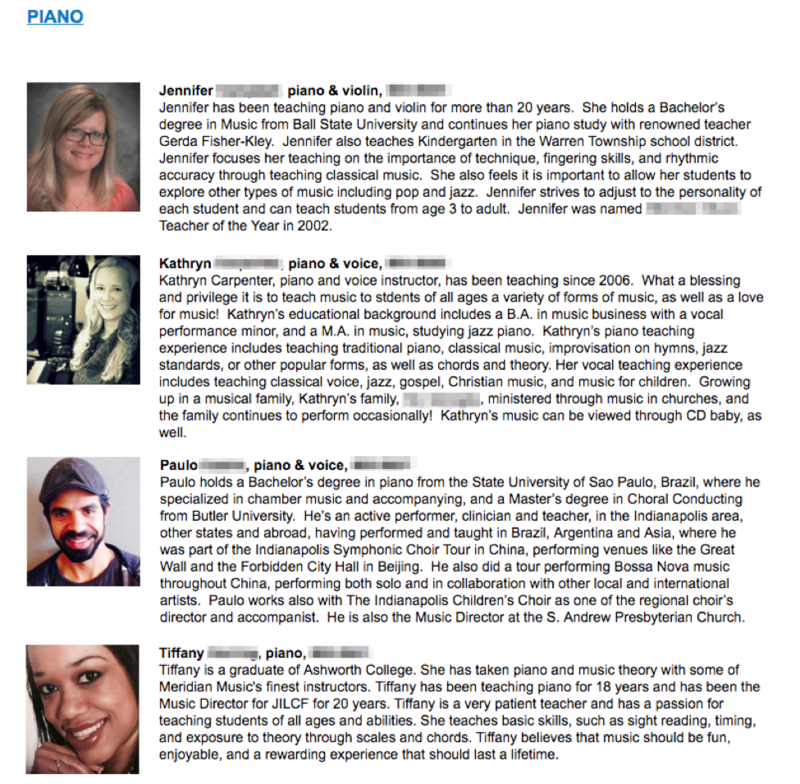 Create an online profile that includes their bio, their story as a musician and a teacher, and their skills. This will help parents connect with teachers prior to contacting your studio. As a company, it helps you ‘sell’ the instructors to potential clients and their families. Once you’ve hired a teacher… you need to get them more students! Ideally, you were planning for this before you began looking for a new teacher. Do not let fear or concern about attracting new students to your studio keep you from this simple way to increase profits and community impact. How to get studio website visitors to do more than “window shop”… get them to reach out and ask you to teach them!!!! I’ll say it. It’s easier than ever to attract new students. The Internet has brought down advertising costs by a factor of 10. Even large music studios still aren’t fully utilizing the power of digital advertising and content marketing. Even small studios can make a huge splash with a little bit of knowledge and a whole lot of hustle. I started this journey by placing one free ad on Indeed.com. I literally made this up as I went along. I reached out to Travis at Music Flow when it came time to actually hire someone. I sought his advice on details (which I’ve shared in full here). The results could be astounding. At the very least, you could hire a part-time teacher to see 10-15 students per week. You could mentor a newly graduated college student. You could help an established teacher who struggles with marketing. You could build additional revenue of several THOUSAND dollars (or more) in 6 – 12 months if you got aggressive with hiring and promotion. Obviously, this requires a strong marketing system… but I know of someone who could help you with that! Do you already have a team? Do you want a team? Let me know in the comments what other questions, comments, or criticisms you have. I’m happy to address them and help in any way possible. Speaking of increasing income, you should fill out this form to work with me. People who do find their incomes go up quite easily! I am looking for information on what is the appropriate rate of tuition to go to the teacher vs. the studio in this sort of example? Thanks. See my answer to Allie just above! I am in the beginning stages. I am looking for teachers. As hiring independent contractors, what percentage of the lesson fee would you pay them? Check what your competition is doing. Ask teachers who you are NOT wanting to employ what they would accept for doing that kind of work. The more answers you get, the more context you’ll have. This is about PRICE DISCOVERY… and by nature, this involves needing more information than you or I have right now. So, research is required. Great article! How do you prevent teachers from taking students from the business? You can’t prevent customers from doing anything… however, you can make it structurally more difficult. Perhaps you have students pay 3 months at a time. Makes it more difficult for them to be poached. Hi Daniel–how do you build a rapport with students and stay connected to them if you’re not their teacher? Do you send out an e-newsletter, or do master classes several times a year? Do you fit in face-to-face time with them somehow? To grow, you have to think like the person you want to become… in your case, someone who has multiple teachers working for her. I don’t think someone like that is thinking that way. This is much more in depth, and I think a good topic for a video or blog post. This is very informative. I am hiring my first employee for the fall and training her through the summer. 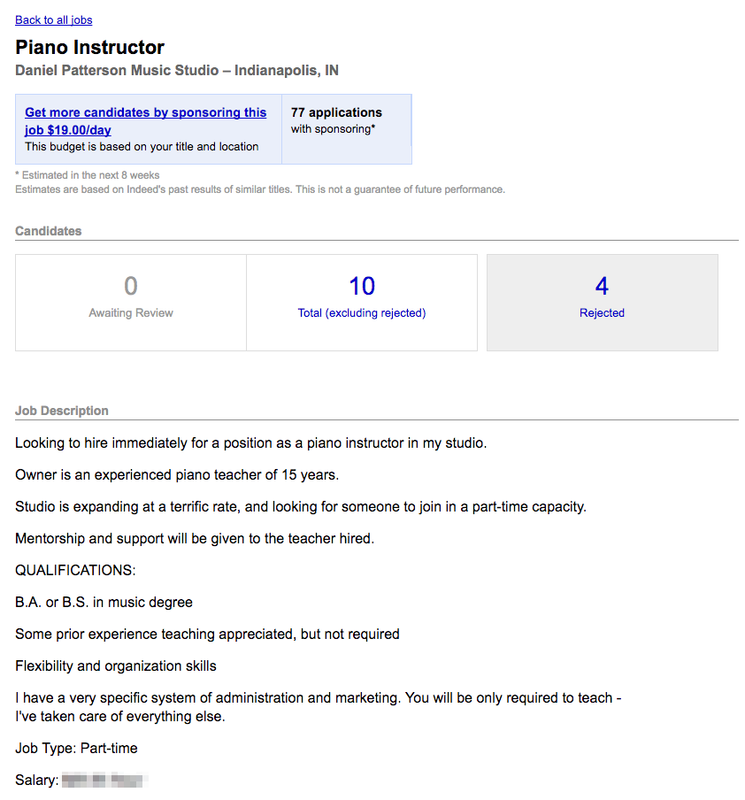 Do you know where to find a sample employer/piano teacher employee contract? In particular, I’m looking to compare non-compete and non-solicit clauses as well as see what topics are all covered. I tried reaching out to several businesses in my area, and they all seemed more threatened by the competition and didn’t want to help me. Thanks ahead of time! That’s a good question, I think there are some as examples in the major piano teacher Facebook groups. Just use the search function to find those threads. I’m not a lawyer either, but at least my research in California, tells me that is unlawful for an employer to have a clause in the independent contractor form that instructs the contractor how to teach. I found this out after I dug around a bit for the Studio I was working at. If you want them to have your modus operandi in lessons, then you must hire them as an employee. Then again if they are young teachers, they might just appreciate your guidance and way of doing things. Yes, I’ve found the same things to be true. Hey Daniel. Thanks for this post. We spoke a couple of months ago on the phone about group lessons and I’ve launched my new program thanks to your help. It’s going quite well although I’m still at the beginning stages of it. I’ve considered hiring another teacher at some point in the future. I’m wondering if you ever considered allowing another teacher to use your studio space at a time when you are not teaching. My idea for the future is to hire another teacher to work on Fridays and Saturdays. There are local laws to consider here for sure. Not sure if you know anything about that. I would do that in the event that I had a commercial space, but that’s something I’m avoiding in my career. It’s not the “right way”. It’s just what I’m doing. I advise many studios who do exactly that, and it doesn’t seem to be an issue. Do you advertise on your studio website that you have another teacher who travels to students’ homes? A separate website? Or do you just offer that as an option when you get contacted by prospective students? It could be done either way. I prefer to keep my message uncomplicated on my website. Also, I run ads that advertise this that run to stand-alone landing pages. Again… to keep things uncomplicated. I have hired private teachers to help me teach in my home before but I’m a bit weary about asking them teach in the student’s home or somewhere else as they can easily recruit the new student later as their own. How do you avoid this from happening? I know you can add it in the contract but what is there to stop the student and new teacher from negotiating a better rate behind your back. It’s all about in screening. I was willing to hold out a long time to find the right person. At the end of the day… it’s up to as business owners to build the relationship with the customer. To build a great relationship with the teacher. Relationships are key. If you neglect them, things like “student poaching” happen. Also… at the end of the day… if it happens, I simply don’t care. I’ve made a habit in my career to not worry about things that I can’t control. I’m very happy with how things have gone. I will keep everyone updated on this… I didn’t have a problem with this 10 years ago when I was doing this with multiple college students and other professionals. I don’t think it’s going to be a problem now. If you as the employer can make the contractor value your long-term relationship more then the short term gain of one higher paying student you are in the clear. I have thought about this a lot in the last couple months because I began teaching at a studio and I really didn’t feel well taken care of. This obviously led to feelings of resentment, scheming (which I didn’t do) – the point is I didn’t feel like the Studio owners cared about making my teaching experience great. Now I have it in my vision to raise a 16-18 year old up as my apprentice (we will see how that goes). That way they are loyal to me and know me well too.